Update: Madhouse doesn’t seem to give a damn and caved in for Marvel’s (MY GOD, Marvel?) junk hollywood property, Iron Man! Blasphermous! 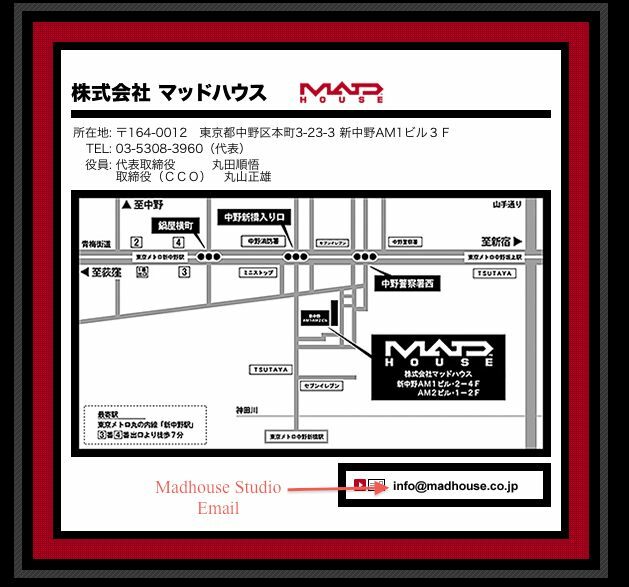 Let’s email bomb Madhouse at info@madhouse.co.jp ! Show them that we, the fans around the world, actually matters! but please appreciate our feelings. Thank you very much! Everyone, I encourage you to write something in your own language to Madhouse, to Jump Magazine (I couldn’t find their email address) and whoever else you think is important in this matter. No matter what happens, let’s show them our devotion! Post your email in “Leave Your Reply” section below for the world to see and remember! @ Mukizu – yes, you’re right. However, without mistakes made, no goodness can be created. Without bloody failures, no success can be found. Besides, to err is human, to forgive divine. Knowing that Japanese animators tend to pull many all-nighters in a row while being paid very little, and having to travel to different countries for fan events on almost nothing, I couldn’t help but respect them. If there is any chance, no matter how slim it is, I want to try. Because I rather fight and fail rather than just sit and do nothing. There’s enough of that. Sorry if this seem off topic. What u wrote was deep, yet true I hope for the best. Pingback: Anime Diet » Petition for Claymore Season 2! I sent email to madhouse. For claymore. I hope we can watch this anime again. Good job! Thank you for writing! I will write MadHouse, but do you really think they give a dam about us. I didn’t even know of a petition so they should redo it. We are we people, and if i’m writing to him i writing it as if it were a persuasive essay. I will speak from my heart. And I will wait as long as it takes even if they are never to do it again. If these people want their name to die out so be it. Let someone who wants the job take up the work. Claymore with more time and effort could be in the top with naruto,bleach,fullmetal and more. Do what your heart tells you to. Just make another one, it’s not like you’re doing anything else special anyway. What if another petition was started this year? Maybe that would show them that even in 2011 people still want more seasons of Claymore. Estoy por resignarme, es nostálgico para mi recordar claymore. La vi hace un mes y me quede picado, seguí el manga hasta el ultimo publicado actualmente, y me entere que lo publican mensual. Hasta ahora ese es mi único consuelo. Espero y de verdad hagan una segunda temporada, nome importa si inician nuevamente el anime. Ya han pasado 7 años mientras exista el manga conservo la esperanza de una segunda o un nuevo anime.